That's what Hikashu needed to make the album, Uragoe. Well, this could be arguable. What is the definition of "making an album" in the first place? The day one was May 14, 2011. The band had performed a concert at Japan Society the evening before, and that day was off, although they had something to do - writing songs for the upcoming session. So that they had to retreat their hotel room and do some work. Makigami already had some ideas for lyrics but no music. For this recording session, they had decided not to use any stock song, which they had plenty, and write brand new songs on the spot instead. The session was coming next day, so the time was imminent. They all locked up themselves at hotel room early and worked throughout the day. Why did they stick to new material? We don't have the answer for that, but we assume it's because the tragedy in March had made them in the mood of not using any old stuff. In fact, around this time, Makigami went to say that "after the disaster, something was definitively changed." Maybe they were compelled to do something completely fresh. Perhaps it's like "it's the time only to look forward, not to think backward." 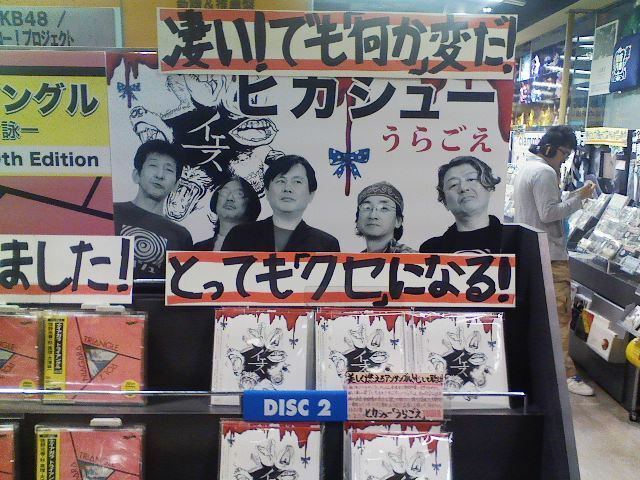 Now Uragoe is magnificently displayed at Tower Records Shibuya, the biggest store of the national chain. The sign says "Terrific! But 'Something' Strange!," "Very 'Addictive!'"